Pop! Snap! It’s here! BIODEGRADABLE bubble! You know the best part of moving day is playing with the leftover bubble! But did you know that regular bubble can take hundreds of years to decompose? Even if all the bubbles are popped! So as a green eco-friendly moving company, my friends at NorthStar Moving® and I went on a search for a greener kind of bubble, and we FOUND IT! This biodegradable eco bubble is just as bubbly, just as poppy, and just as shiny, except, it’s GREEN! When the new packing materials arrived, the biodegradable bubble wrap glowed in translucent green wonderfulness! Unlike the old bubble, this green eco bubble from Polycell does not last forever. Following your moving day, after you’ve popped all the bubbles, this eco-friendly material can be discarded with the peace of mind that comes from knowing it will degrade, crack and finally breakdown into smaller pieces with the aid of UV light, oxygen and or heat thanks to its unique ‘Reverte’ Oxo-biodegradable additives. These smaller pieces can then be ingested by microorganisms within the landfill and will finally biodegrade into CO2 & H20 plus biomass. …who doesn’t care about acting all cool, I just want to tell the whole world how awesome our new biodegradable green eco bubble is! 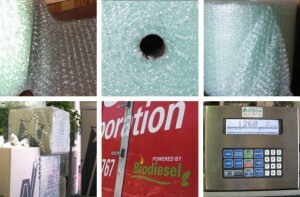 Our green eco bubble fits right into our green moving family, right alongside our recyclable moving boxes, recycled packing paper, weigh scale, and bio-diesel trucks. NorthStar Moving® and I are soooo happy to help protect the environment one bubble at a time! Make sure to ask your moving company for eco-friendly moving materials. Even when moving we can do our part to help our planet here are 7 ways to a Green Move! We’d also love to hear how you recycle your bubble, share your ideas below.